The splendid Taj Mahal exudes romance; Laila-Majnu & Romeo-Juliet made romance eternal and provided it with unforgettable depth. Majnu (meaning mad) is the nick name given to Qais, yes one becomes practically mad & acts like as though the lovers are the only humans left on earth! Remember Tom Cruise love struck shenanigans on Oprah’s sofa? (Watch it here if you haven’t)One can blame it all on chemicals in the brain… in that state the whole world seems like you’re the proverbial kid in a candy store! My doctor friend (love marriage) would say you can talk, walk, sleep & eat love. Everything is fair in love (& war). Love is blind & Romance is deaf & both are dumb (clearly, Tom Cruise gets speechless!) It’s something thats so very beautiful & tingling!! Love is intangible, just a feeling that cannot be explained, nor can you make someone else understand or experience through your experience. It is like the scent of musk which cannot be hidden: it’s beyond control & will express itself somehow or the other. The beauty of Love is that it is an unplanned natural process & no one has control over it. It is almost always instantaneous, a random act that cannot be bought or sold like a commodity or force someone to fall in love. There is no age bar for Love/Romance & it goes hand in hand. However, in a human relationship there is no Romance without Love but there can be Love without Romance. Then is it limited to human beings alone? In general Romance is the name given by us humans for expressing the Love between two sexes. Yet the word is rampantly used in varies forms… Only individual perception differs. It is there all around us from a small bug to the greater beings… for those who want to see & feel, the air is filled with Roooooomance………. in anything you like a beautiful flower, misty morning, gleaming dew drop on the grass, muddy smell from the first shower, a nice fragrance, full moon, the fresh air of the mountain, sound of the ocean, birds, country, etc., etc., which really recharges anyone. So again it comes back to the chemical factor: all that we have to do is open our eyes & ears to see/hear it. That’s why the Romance is in the air… murmuring the sweet nothing.. just look up & smell it… gather it…pull it down.. and bag it! One of colleagues scream there is no such thing as love and romance. Any one says there is I will hit them!! In an era where the divorces are increasing in an alarming rate a couple could get few tips from certain reptiles… why reptiles.. Well we are not very different from them: they shed their skin like we do. Come-on everybody fill your life with Roorooomance not with neigbour’s partner but with your own. Romance & courtship is the most important thing… it makes the Love strong & bonding… & you will feel good about yourself. Up until 80s, a majority of people had arranged marriages, some even meeting for the first time on the wedding day!! Does that mean love-romance was absent from their life? Love can be gradual too & changing into Romance is a choice, an art where you are the artist. Paint it red, blue whatever your favourite shade is. By the way upto 80s the percentage of happily lived ever after was indeed higher!! Common getup & rekindle it in 2014. Don’t wait for the snakes to knock on your door. It’s the tool which spells the beginning of happily lived ever after!! WOW (positively) in case you are wondering what is the red & green spread on the ground? Well its fresh coffee beans of course… don’t worry the beans were not contaminated… both of them were so caught up with each other… & normally they don’t harm you unless they smell danger from you… don’t you think COFFEE is kind of romantic… I find the flowers romantic & the snakes find the beans romantic… (We are cousins!!) what about you? 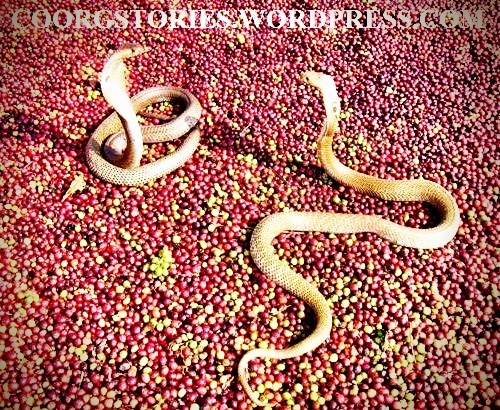 At least have a coffee on me… try full bodied Nespresso Indriya which is the blend of the marriage between Arabica with a touch of Robusta Coffees which probably came from the same yard, the bed of Romance of Mr. & Mrs. Snake! A big thank you for all of you for reading my blog & encouraging me to write…… I have expressed my opinion on love & romance, but it differs from person to person. I would love to have your comments & thoughts on this. Wish all my Readers a Very, Very Happy NEW YEAR….. A snaky Romance & a big god bless you… lots of Love… be romantic & get lost in the Love/Romance… high time to recharge and rekindle and bring back the sparkle. This year for the second time in my married life, I will be celebrating my New Year over Skype with my husband even that is kind of romantic… he will sit there blowing fish kisses.. waiting for each other to close the Skype… hum if we can feel it why not you?